The land of Arezzo has been inhabited since the most remote times. The oldest human find is the so-called “skull of the man of Elm”. Found in 1863 near the village of Olmo, it dates back more than 12,000 years. Far more distant are the oldest archaeological finds: objects roughly worked in stone older than 150,000 years. The city itself was born in the Etruscan era, but certainly a town on the hill of Arezzo already existed more than three thousand years ago: a village of huts with much probability in the area of Piazza Sant’Agostino, near the torrent Castro. 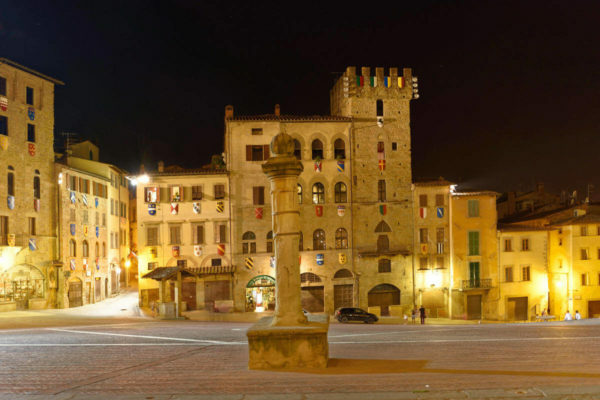 Arezzo is Etruscan in the seventh century a. C. and soon became the capital of one of the powerful 12 Lucumonie in which the confederation of the Etruscan peoples was divided. But against the common enemy Arezzo (defense center together with Pisa and Rimini) has always sided with Rome: in 285 a. C. fought near the Arno against the Senoni Gauls and in 217 BC to Lake Trasimeno against Hannibal and his Carthaginians. In thirteen years, the Arezzo were among the highest suppliers of weapons and provisions for the victorious expedition of Scipio in Africa against Carthage. When the Roman Empire fell under the blows of the peoples who came from the north, Arezzo too was forced to undergo conquests and destruction. Among the first free Municipalities, Arezzo in the XIII century expands in the surrounding territories colliding with the other Tuscan powers. In 1288 the Aretines defeated the Sienese in Pieve al Toppo. But on 11 June 1289 they were beaten in Campaldino by the imposing army of Florence. The Aretines succeeded in resisting and recovering under the guidance of Bishop Tarlati. The boundaries began to widen dramatically and the city had new great walls. Unfortunately the bishop died in 1327 due to a pestilence contracted during the siege of Pisa. And the successors could not keep the vast Aretine state in their hands. At the height of the crisis, in 1384, Florence obtained the final surrender of Arezzo paying the extraordinary sum of 40,000 gold florins. Since then the fortunes of Arezzo are linked to those of Florence. 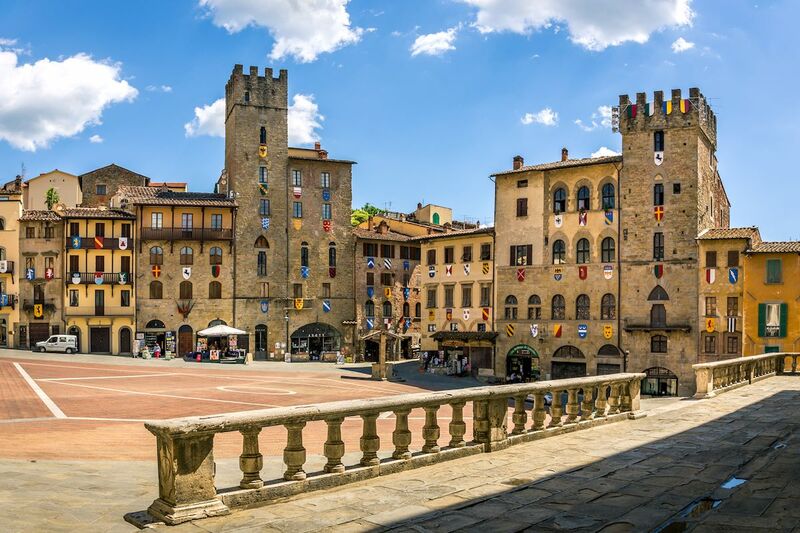 Arezzo, chief town of Tuscany, lies on a hill dominating the fertile plain where the Val di Chiana joins the Arno. His beautiful medieval and Renaissance historical center has been immortalized by Roberto Benigni in the famous film “La vita è bella”, winner of an Oscar in 1999. Arezzo was also the birthplace of Guido Monaco or Guido d’Arezzo, inventor in the eleventh century. musical notes, by Petrarch, by Giorgio Vasari and by Pietro Aretino. Given the wealth of works of art concentrated in its historic center, art tours and cultural tours of Arezzo allow you to discover the charm of this city still outside the mass tourist circuits. Giorgio Vasari and Piero Della Francesca have always been the historical testimonials of Arezzo. Their artistic and architectural legacies are, still today, the most important attraction of the city. Everything refers to them: the loggia of Piazza Grande, the frescoes of the Basilica of San Francesco, the Cathedral of San Donato, the Casa Museo di Vasari. But there is not only this: Arezzo offers much more. Basilica di San Francesco: The small church in stones and bricks is famous because it houses “The Legend of the True Cross” by Piero Della Francesca, rightly considered one of the absolute masterpieces of Italian art. The cycle of frescoes is inspired by the Legenda Aurea written by the Ligurian bishop Jacopone Da Varagine and very popular in the Middle Ages. The “Legend” tells the story of the piece of wood with which the Cross of Jesus was built: raised from the branch that God placed in the mouth of Adam dead, the tree was to be used to build the Temple of King Solomon but “rebelled” shortening and lengthening if necessary. Thrown into a river was used as a walkway until the Queen of Sheba prophesied its use. Solomon then had him buried until the Israelites found him to make the Cross of Jesus. The frescoes unfold in a non-chronological way but are aligned by symmetry: at the top there are the outdoor scenes, in the central part court scenes on an architectural background, and, below, the battles. 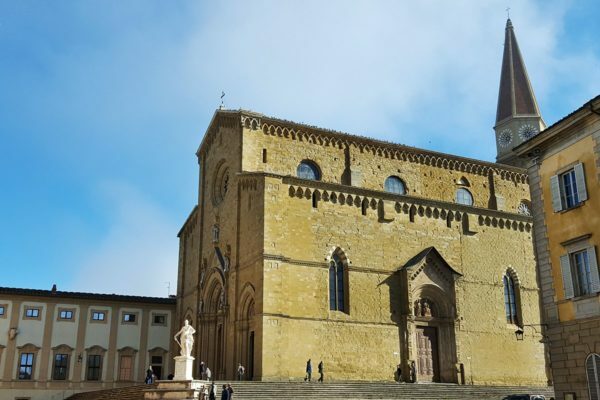 Inside the Basilica of San Francesco you can also admire a fresco by Luca Signorelli and the great central Crucifix of the Master of San Francesco. 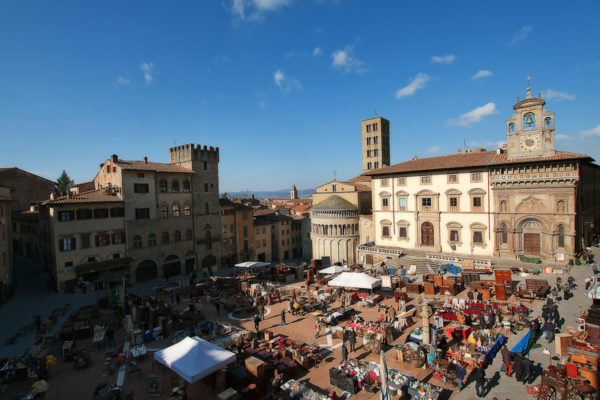 Piazza Grande or Piazza Vasari of Arezzo is one of the most harmonious architectural complexes in Italy, and therefore in the world. Built on a steep slope, on its unusual trapezium shape overlook churches, historic buildings, loggias and old shops. On the left is the Parish Church of Santa Maria and the Laici Fraternita Palace with the still functioning astronomical clock. On this side there is also the splendid public fountain. On the high side of the square stands the outline of the Palazzo delle Logge built on a project by Vasari. On the right, Palazzo Lappoli with its wooden gallery and Palazzo Casatorre dei Cofani with its characteristic tower. Curiosity: this is the square of “La vita è bella” by Benigni, when you see him repeatedly on a bike. 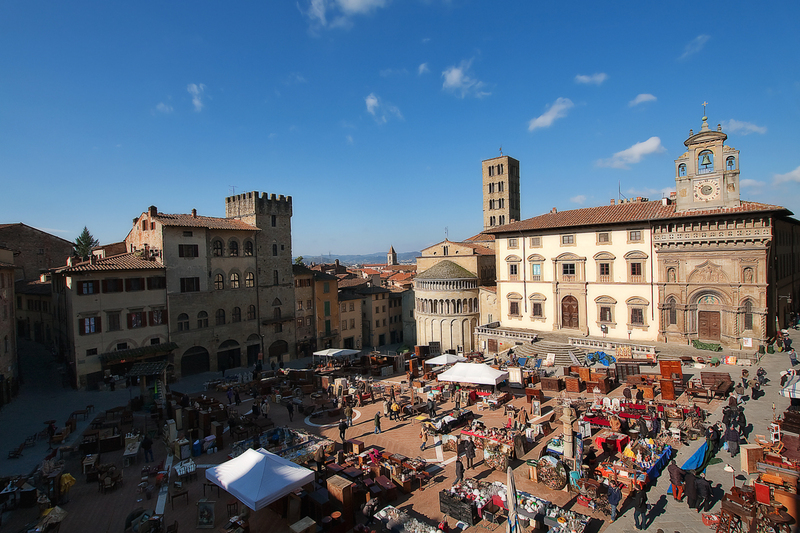 Piazza Grande is home to the monthly Fiera dell’Antiquariato and the Giostra del Saracino. 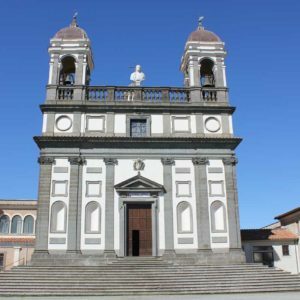 If the Church of San Francesco is the most loved by tourists, due to the presence of the frescoes by Piero Della Francesca, the Cathedral of San Donato is the church of Arezzo which has followed the vicissitudes over the centuries. Built on the site of the ancient city Acropolis, it was built starting from 1278 and finished only in 1500. The facade was rebuilt in the early 1900s while the original interior is divided into three large naves. The stained glass windows by Guillame de Marcillat and the Maddalena by Piero della Francesca stand out in 1465. The adjacent Diocesan Museum houses several works including some by Vasari and Luca Signorelli. The marble panel with the “Baptism of Christ” decorating the Baptismal Font is attributed to Donatello. The great Crucifix of Cimabue, recently restored, is the great attraction of the Basilica of San Domenico. The large cross, more than 3 meters high, is the first work attributed to Cimabue and was painted between 1268 and 1271 approximately. The Romanesque-Gothic exterior has an unfinished façade with a bell gable. The interior has a single nave with mostly deteriorated frescoes while the Gothic altar of the Dragondelli Chapel is still visible. Overlooking Piazza Grande, the apse of the Pieve di Santa Maria contributes to the overall setting of the main place of Arezzo. The main facade of the church is hidden in Via Seteria, to the left of the square. It has five blind arches in the base and three orders of loggias that stand on 68 columns. The mighty bell tower on the right is called the “100 holes” for the particular processing of mullioned windows on five floors. The interior has three naves with a trussed ceiling. The most important work of the Pieve is the Pietro Lorenzetti Polyptych depicting a Madonna with Child, the Annunciation, Assumption and 12 saints. The apse, which overlooks Piazza Grande, is Romanesque with blind arches and two overlapping loggias. Discover Civita Castellana you could admire the gorgeous work of the Cosmati family the most skilled to make floor with marble mosaic. 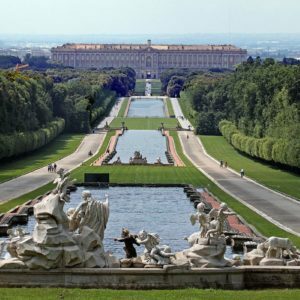 The Royal Palace of Caserta and its park, two jewels of unparalleled splendor, have been included in the UNESCO World Heritage List in 1997. 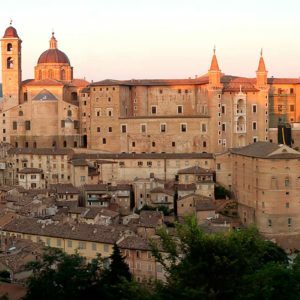 Urbino, a city with a thousand year history where you can breathe the Renaissance and the future of generations, thanks to its dynamic university.